Recognise and protect the diverse tenure and production systems upon which people’s livelihoods depend, including the communal and customary tenure systems of smallholders, Indigenous Peoples, pastoralists, fisher folks, and holders of overlapping, shifting, and periodic rights to land and other natural resources, even when these are not recognised by law, and while also acknowledging that the well-being of resource users may be affected by changes beyond the boundaries of the land to which they have tenure rights. Up to 2.5 billion people, including 370 million Indigenous People (IPs), depend on land and natural resources that are held, used, or managed collectively for food, shelter, livelihoods, and cultural identity. These lands – which include forests, rangelands, farmlands, mountains, and shores – cover more than 50% of the world’s surface. While IPs and local communities have protected these lands for centuries, they have legally recognised ownership over only one-fifth of them. As a result, at least 40% of the world’s land surface is vulnerable to grabbing by powerful actors for plantations or fossil fuel projects, hydroelectric dams, tourism, speculation, or conservation. This undermines not only the human rights of local people but also threatens sustainable development and, in particular, the fight against climate change. ILC, Oxfam, and the Rights and Resources Initiative (RRI) launched the Land Rights Now campaign with the “Common Ground – Securing land rights and safeguarding the earth” flagship report in March 2016. The campaign has a target of doubling the amount of land recognised as owned and controlled by IPs and local communities by 2020 and has made concrete recommendations for action to governments and other stakeholders. The campaign is part of a wider Global Call to Action to secure Indigenous and local community land rights that also included the formation of the Interlaken Group, a private sector network dedicated to community land rights; a series of biannual conferences bringing together governments, the private sector, and civil society; and the LandMark map, which has resulted in various local-to-global initiatives. Since then, more than 800 organisations from more than 100 countries have endorsed the campaign’s target, and over 100 have engaged in campaign activities. Campaign “wins”, growing demand by communities, and an expanding supporter base testify to the success of the campaign and its enormous potential. In March 2018, the Land Rights Now campaign supported the Liberia Civil Society Working Group on Land Rights Reform in its campaign calling on the country’s government, including President George Weah, to pass the pro-community Land Rights Act. CSOs had called for the Act to be revised to align it with the AU’s Framework and Guidelines on Land Policy, UNDRIP, the VGGTs, and the SDGs. Following an intense campaign at national and global levels, the Senate passed the Act into law in August 2018 – but this would not have happened without thousands of people raising their voices. It is Liberia’s first comprehensive land rights act and will improve the lives of three million people who depend on land for their livelihoods. They will have the power to decide the future of their lands, with sustainable investment and development opportunities and protection from unscrupulous corporations. 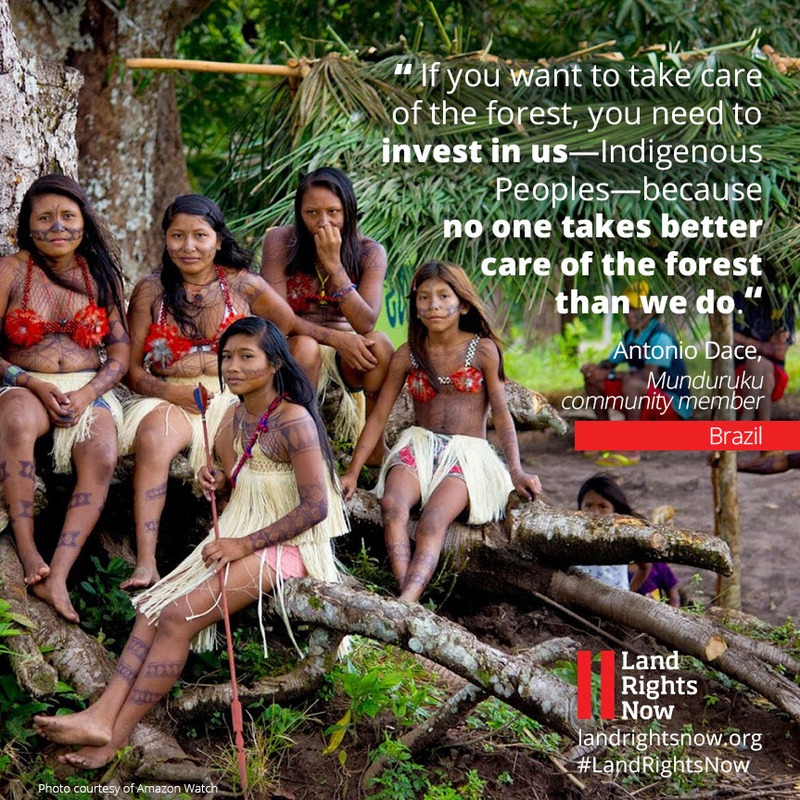 Elsewhere, the Land Rights Now campaign has supported the work of an alliance of Indigenous organisations in Peru challenging corporations responsible for pollution on their lands, which led to an agreement with the government on the right to Ccnsultation. It has also provided targeted support to national campaigns in Brazil, Nepal, Cameroon, and South Africa. To date, more than 800 organisations have joined the campaign, including more than 80 ILC members. Campaign coordinator Fionuala Cregan believes that its strength lies in “amplifying voices with global communications support and raising global awareness of the issues and building a movement of people calling for recognition of land rights around the world”. In 2016 and 2017, Land Rights Now led a global mobilisation of land rights advocates on Indigenous Peoples’ Day and again on Earth Day, with over 70 events taking place across 42 countries. Demonstrating the global nature of the issues being highlighted, a series of short films has been produced, focusing on land rights issues in India, Mongolia, Nicaragua, and Scotland. Join Liberian CSOs in calling for a progressive Land Rights Act now! The goal of the Rangelands Initiative is to increase the tenure security of local rangeland users through improved development and implementation of policy and legislation. Among other things, the Initiative focuses on identifying, developing, and scaling up innovative solutions to tenure challenges, and assisting governments and other stakeholders to develop and implement supportive policy and legislation. Bringing ILC members and partners together under the auspices of the Initiative allows for joint and strategic development of solutions. The Initiative also improves the understanding of rangelands and appropriate governance, planning, and tenure systems through research and the documentation of good practice. Recognising the value of rangelands and the livelihoods systems they support, it advocates for the inclusion of rangeland users in decisions made about their lands. The global component of the Initiative is coordinated by the International Livestock Research Institute (ILRI) and it is led by a group of nine international partners – ILRI, UN Environment, IFAD, FAO’s Pastoralist Knowledge Hub, CIRAD, the International Union for Conservation of Nature (IUCN), the World Resources Institute (WRI), ICARDA, and the US-based Rangelands Partnership. The Africa CBI is coordinated by the Resource Conflict Institute (RECONCILE), Kenya; in Asia the CBI is implemented by two hubs: the Environment and Development Association (JASIL), Mongolia and the Maldhari Rural Action Group (MARAG), India. The Initiative also involves the Semiáridos Platform in Latin America, coordinated by FUNDAPAZ, Argentina. The nine international partners in the Rangelands Initiative work together to influence policy and to highlight messages from the regional initiatives to a global audience. For example, they have worked to increase the emphasis on pastoral land issues in the SDGs, working with UN-Habitat, GLTN, the ILC Dashboard, the World Bank, and the AU to build indicators to measure change in rangelands. The Initiative is also part of the campaign to designate 2021 the UN International Year of Pastoralists and Rangelands. To engage with the broader land community, in 2018 the Initiative partnered with the Land Portal to conduct an e-discussion on Making Rangelands More Secure, in English, Spanish, French, and Russian. This was one of the portal’s most successful online dialogues, with 38 different participants contributing from four continents. It allowed for the sharing of good practices, challenges, options, and opportunities in making rangelands secure, as well as a discussion about multi-stakeholder platforms, as inputs into development of the Initiative. Together with the Land Portal Foundation, the Rangelands Initiative also documented a Learning Route on “Innovative practices and tools to reduce land use conflicts between farmers and livestock keepers: Experiences and lessons from Kenya and Tanzania” on 22–30 September 2017. The Learning Route was led by Procasur, RECONCILE, ILRI, and IFAD (for staff of IFAD Nigeria and the Government of Nigeria), with 25 participants travelling to Kenya and Tanzania to learn about innovative ways to reduce land use conflicts between farmers and livestock keepers. To gather contributions from members, the Initiative also developed a thematic portfolio on the Land Portal website on Rangelands, Drylands, and Pastoralism. Launched in February 2018, the page will be updated with new datasets and other relevant information, including good practices from ILC members. This regional CBI coordinated by RECONCILE involves nine ILC members in eight countries: three in East Africa (Uganda, Kenya, and Tanzania), four in West Africa (Burkina Faso, Nigeria, Niger, and Senegal), and three in Central Africa (Chad, Cameroon, and Central Africa Republic). Emerging lessons on rangelands issues were shared via a learning exchange in Cameroon in 2017. Rangelands Africa has also supported the mapping of communal lands in six counties in Kenya, highlighting their spatial status, natural resources, and the status of investment. This facilitated a more context-based decision by the government and by members involved in developing the country’s community land law, and contributed data on Kenya to LandMark. The CBI joined forces with the Coalition of European Lobbies for Eastern African Pastoralism (CELEP) to raise funds for a flagship four-year project on participatory rangelands management in Kenya and Tanzania that started in 2018. This is a good example of how CBIs can support initiatives that engage key members and partners and that can eventually stand on their own. The Rangelands Initiative in Asia has organised its work into two components: Central Asia, coordinated by JASIL and involving a network of four members and eight non-members; and South Asia, coordinated by MARAG and with four ILC members and five non-members. In its first year, the CBI produced scoping studies on rangelands for six Central Asian and three South Asian countries, with four regional working group meetings to discuss the main findings and to share lessons and experiences between the two sub-regions. The CBI conducted key advocacy work at country level across the region, including in Kyrgyzstan, India, Mongolia, and Afghanistan, sensitising governments and committing them to put rangeland issues on their agendas.In Afghanistan, the CBI contributed to the development of a policy draft on rangelands and commons, while in India a similar process was carried out in collaboration with the country’s NES platform. The goal of the Rangelands Initiative in Central Asia is to build a network for protecting diverse tenure and production systems, which provide livelihoods for pastoralists and other rural people. By connecting, mobilising, and influencing, the Initiative supports the activities of ILC members in individual countries, including via NES, and across the region. A regional strategy for Central Asia was developed and agreed with all members and partners of the of the initiative during the second sub-regional working group meeting on "Diverse Tenure Systems for Rangelands in Central Asia", held on 6–7 July 2017 in Ulaanbaatar, Mongolia. ILC members in Mongolia (JASIL and Mongolia Land Management Association (MLMA)), Kyrgyzstan (Rural Development Fund, Association of Forest and Land Users of Kyrgyzstan, and the Union of the Water Users’ Associations), and Kazakhstan (Institute of Ecology and Sustainable Development and Farmers Foundation of Kazakhstan) have developed a learning and engagement process on rangelands to facilitate joint advocacy, monitoring, and support at national and local levels. It has been an opportune time for such work in the region. In Mongolia, communities are awaiting approval of the draft land law, which has been under discussion in parliament since 2013. In Kyrgyzstan, the 2009 law on pastures has yet to be fully implemented, while in Kazakhstan no such law has been developed. Sharing experiences is valuable for strengthening interventions in individual countries and across the region. Over the next few years, ILC members in Asia intend to further develop the rangelands initiatives in order to influence policy and legislation and its implementation. In 2016–2017 the Central Asia RLI strengthened the network and alliances between ILC members and partners (Centre for Policy Research and the National Association of Pasture User Groups, Mongolia; Kyrgyz Jaiyti, Kyrgyzstan; Farmers of Kazakhstan; NADF, Tajikistan), with greater capacity to protect diverse tenure systems. In addition, the Initiative supported a scoping study and mapping for Mongolia, Kyrgyzstan, Kazakhstan, and Tajikistan, and organised the first sub-regional working group meeting on Diverse Tenure Systems for Rangelands in Central Asia, which took place on 21–22 February 2017 in Bishkek, Kyrgyzstan. The WG meetings, roundtable meetings, field trips, and regional information sharing also maintained the exchange of experiences and lessons on protecting tenure systems. Experience sharing has been one of the main resources for strengthening interventions in individual countries and across the region as part of the Initiative. Over the next few years, ILC members in Central Asia intend to further develop the RLI in order to influence the development of policy and legislation and monitor implementation. Historically, common lands in the Indian state of Gujarat belonged collectively to the pastoralists living there. They were never claimed or registered under private title. However, in recent years a large proportion of the grazing commons in Gujarat have been acquired – or grabbed – by investors and other actors, pushing out traditional local land users. This made it extraordinarily difficult for pastoralists to maintain their livestock and has discouraged youth from following the pastoralist way of life. Maldhari Rural Action Group (MARAG) worked with local communities to launch “Wheels of Hope”, a motorbike campaign that covered a distance of 1,200km, taking in nine districts and 25 blocks in eight days. The campaign specifically targeted community development blocks with the highest rates of encroachment and acquisition of common land. Communities in Gujarat have campaigned for land to be allocated and titles registered for every family and their livestock. Wheels of Hope allowed them to challenge the occupation of common lands and to establish that rights over the commons belong to those who depend on them for their livelihoods. In response, the government admitted that encroachment on common grazing lands was taking place and committed to working with MARAG and the pastoralist community to protect the grazing commons. In addition, it passed a resolution to protect common grazing land and issued a notification that community members who use pasturelands, particularly pastoralists and women, would receive land titles. As a result, MARAG made 7,000 applications on behalf of community members. MARAG was invited to assist in other areas that were not covered by the motorbike campaign, including the Rampara Wildlife Sanctuary area, where an Eco-Sensitive Zone (ESZ) has been established. Importantly, the campaign has inspired interest among young people in participating in and sustaining traditional livelihoods.